Extraction of third molars is the most common surgical procedure performed in oral surgery on a daily basis and, despite surgical skills and expertise, complications may occur. Complications observed during or after third molar removal may include pain, swelling, bleeding, infection, sinus perforation and nerve damage. Fortunately, with a proper management and a good surgical technique, the incidence of such events is low. 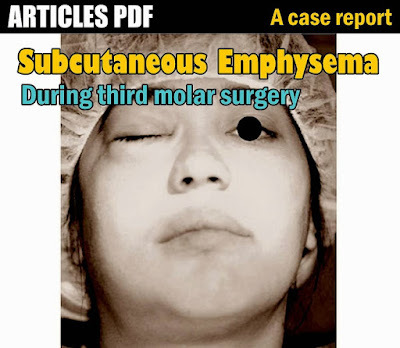 Subcutaneous emphysema associated with dental extraction occurs when the air from the high-speed dental handpiece is forced into the soft tissue through the reflected flap and invades the adjacent tissues, leading to swelling, crepitus on palpation and occasionally spreading through the tissue spaces of the fascial planes. Although rare, iatrogenic subcutaneous emphysema can have serious and potentially life-threatening consequences. Care should be taken when using air-driven handpieces. The access of air into the facial tissues is not limited to tooth extractions, but may also occur through other portals of entrance, such as endodontically treated teeth, periodontium and lacerations of intraoral soft tissues. When subcutaneous emphysema occurs, it must be quickly diagnosed and properly managed to reduce the risk of further complications. This report presents a case of subcutaneous emphysema occurred during extraction of a mandibular third molar extraction with the use of an air turbine handpiece. Case management is described and issues relative to the diagnosis and prevention of this surgical complication are discussed.